What is the Employee and Family Assistance Program? The Employee and Family Assistance Program (commonly known as EFAP) is a voluntary, confidential, short term counselling service. The purpose of this program is to help employees and their families with problems that have an impact on their home or work life. EFAP is supported by both the MGEU and the Government of Manitoba. Since 1972 we have helped thousands of employees and their family members. 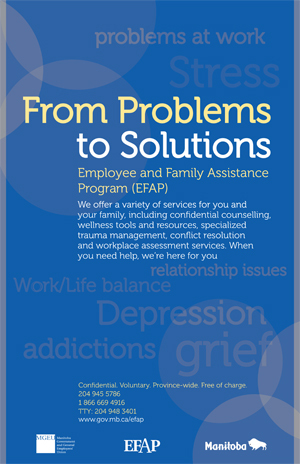 EFAP services are provided free of charge to eligible employees and their family members. Government of Manitoba employees, employees of contracted organizations, as well as family members (spouse, partner or dependent children) who reside with the employee, can use our EFAP services.